The 5th of February was when the USCCB invited us to celebrate the “National Day of Prayer for the African American Family” So, I’ve included the prayer for this special day on the fifth slide in the deck. Like yesterday’s post, this one is different. For five years now, I’ve invited my students to help me create a prayerful presentation to remember All Souls’ Day. You can link to this year’s presentation HERE. If you’d like to share this with your students, please let them know that every image is one to remember a loved one who has departed this life. If you would like to watch it yourself, please remember these beloved souls. And perhaps this presentation will inspire you to create a similar one next year with images related to your own students. A note: I didn’t encourage the inclusion of pets, but these students really wanted to remember these friends. But I do think it’s appropriate in light of Pope Francis’ words about animals and Heaven. November 1st is one of my favorite days of the Church calendar – in part because we get to sing the beautiful Litany of Saints during liturgy. A couple of years ago I was inspired to find images of each of the saints mentioned in the hymn. I share this with you as I hope you’ll share it with your students as I share it with mine. And a link to the corresponding music. So, play the music and run the presentation as you “click” from slide to slide in synch with the saints named in the song. Blessings! How Much of Your Life Has the U.S. Been at War? 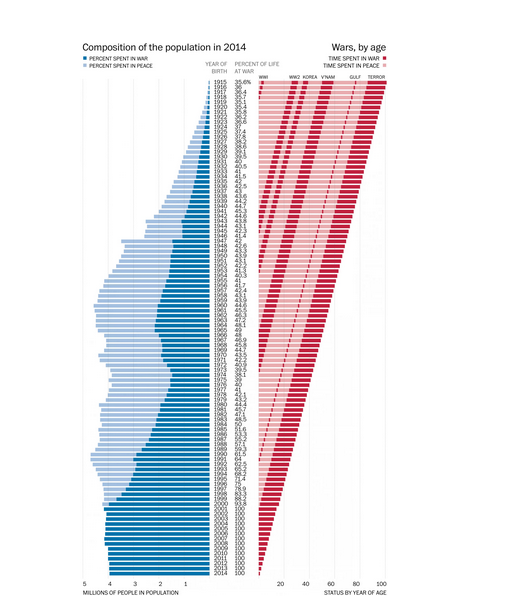 The always interesting Washington Post recently published this thought-provoking graphic illustrating birth year and percentage of one’s life to date during which the U.S. has been at war.